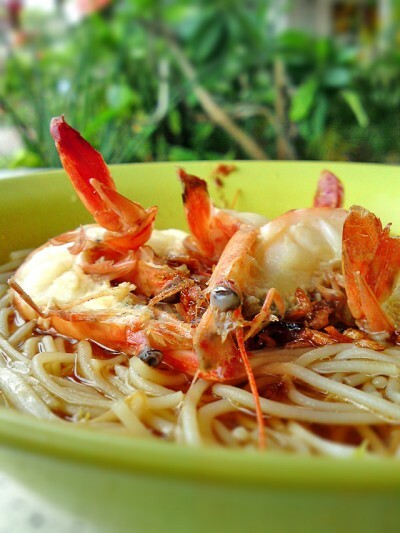 I don’t remember seeing any Big Prawn Noodles stall in Malaysia, instead there must have, at the very least, several dozens of it in Singapore, so do you think that makes Big Prawn Mee an authentically Singaporean food? 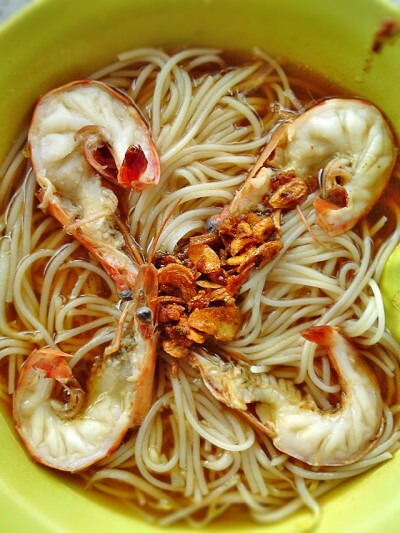 Ironically, Big Prawn Mee is rampant around Jalan Besar, Beach Road area. Further north a little, you can see a few others like Wah Kee at Farrer Road, and Hoe Nam at Bendemeer. I guess it ain’t rocket science that Big Prawn Mee must had been invented around that area but a surprising fact is that it still hasn’t ventured much into the eastern side of Singapore except for 1 stall. 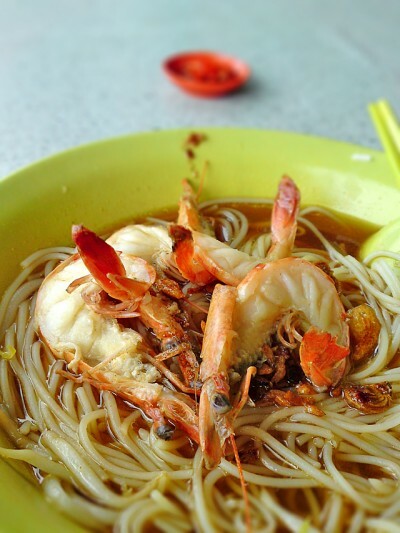 If you’ve ever travelled on East Coast Road, I’m sure you would have came across Beach Road Prawn Mee Eating House near Siglap. This prawn mee stall hailed from Beach Road and from my observation, they seem to have mastered the art of pulling the crowd. Nevermind that the area has no decent parking facilities, people just can’t seem to stop appearing, even at non meal times like 3pm. And it’s not only the tables that are filled, the queue at the counter was even quite long. The cheapest bowl here is $4.50 and you get 2 medium sized prawns sliced in half while several other combinations allow you to add pork ribs or other bigger sized prawns to your bowl. At $4.50 it should be considered as reasonable except that they seem to use tiger prawns instead of the banana prawns as in other stalls I’ve eaten at. Tiger prawns are of course cheaper so amongst all the big prawn mee that I’ve eaten, here provides the least shiokness as far prawns are concerned. With the disappointing prawns, I was expecting the soup to be spoon-licking good but alas it didn’t. I think many $2.50 prawn noodles’ soup can even topple this. Though it looks quite good and as much as I want to show off the shiok factor of this prawn noodle, there really isn’t anything that’s worth a rave. 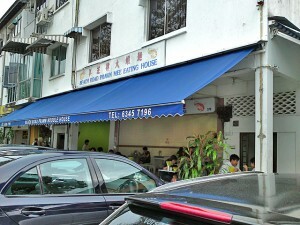 Beach Road Prawn Mee Eating House turned out to be one of those places I don’t understand. They are crowded and famous for reasons I don’t know and the fact that parking your car here is extremely difficult just makes the strong crowd almost spooky. Conclusion: This is a very popular big prawn noodles stall and the crowd is forever strong but yet it it didn’t charm me. Since they are located at the heart of siglap/katong, I’m just guessing that this could be a rich man’s prawn mee. Dislikes: Tiger prawns used instead of banana prawns. Soup no power.